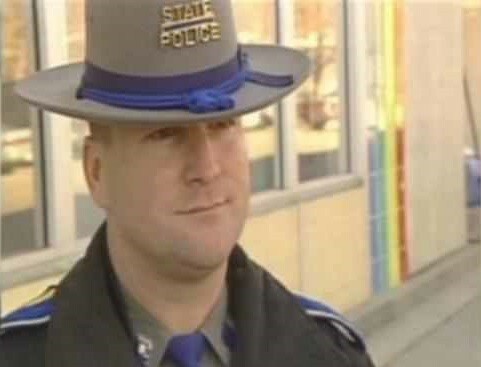 A Connecticut state trooper is due in court this fall for sentencing, after he was found guilty of stealing from a motorcyclist who was dying on the side of the road. Dash cam footage from the officer’s patrol car showed him stealing cash from the dying man, as well as a golden crucifix. On Wednesday afternoon, Aaron “AJ” Huntsman, a 19-year veteran of the state police, pleaded guilty to two felony charges of third-degree larceny and tampering with evidence. Although your average person would face up to ten years under these same charges, officer Huntsman is looking at a maximum of a year and a half, plus five years probation. He even has the ability to plead for a lesser sentence, just because he is a cop. The victim of the theft was 49 year old John Scalesse, a former executive of a company called JAS Masonry. Scalesse was killed on Sept. 22, 2012 after his motorcycle crashed into a construction company truck on the highway. In his dying moments, Scalesse was approached by officer Huntsman, who was the first cop to arrive on the scene. Huntsman walked over to where Scalesse was laying, bent down and picked up Scalesse’s gold chain and a roll of bills containing $3,700. When asked about the money by Scalesse’s grieving father, Huntsman had said that that he didn’t see any money at the scene. The lie ultimately became exposed when the cash was found under the front seat of Huntsman’s patrol car. According to State Police, Huntsman continued to claim that he was innocent, even after he was shown a video of him taking the money.